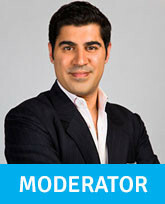 Parag Khanna is a leading geo-strategist, world traveler, and author. He is a Senior Research Fellow at the New America Foundation, Senior Fellow at the European Council on Foreign Relations, Visiting Fellow at LSE IDEAS and Director of the Hybrid Reality Institute. He is author of Hybrid Reality: Preparing for the Age of Human-Technology Co-Evolution (2012), the international bestseller The Second World: Empires and Influence in the New Global Order (2008) and How to Run the World: Charting a Course to the Next Renaissance (2011).